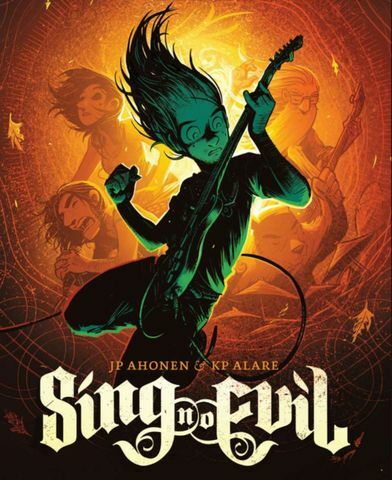 Sing no Evil is a very interesting comic from Finish Legends J.P Ahonen and KP Alare. Never heard of them.. well not surprising this is there first graphic novel to make it to an English print but that hasn't stopped them from causing a huge splash in the independent comic scene. If I was going to liken it to a popular western comic I think Scott Pilgrim might be a good choice. Not that they are really comparable in most ways but there are some similarities that a newcomer can latch onto. The most obvious links is that they are both about youth culture. While Scott Pilgrim is really about kids becoming Young Adults, See no Evil is at it heart about Young Adults becoming Adults. They both have a strong musical aspect to them revolving around friends who are all in a band together and they are both cartoonish in their presentation. Also, like Scott Pilgrim they both add a touch of fantasy to the mix. That being said this is NOT Scott Pilgrim. I feel this is a more sophisticated attempt to explore similar ideas about the growth of personality that occurs as you age. The main drive of this division is the age of the protagonists. They are older and face older people problems and this translates into, for me at least, more interesting situations than I saw in the Pilgrim books. 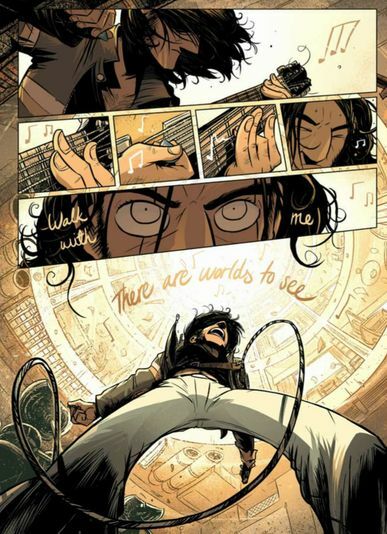 The story dose have more traditional "comic-booky" type stuff going on in the form of magic and the supernatural, but for now I would like to look past that. The real gold in this story is in the relationships and the activities of a small group of friends. In my mind the supernatural elements in some way distracted from the comic witch reads kind of like a quirky romcom. In particular I enjoyed the long suffering girlfriend who supports her obsessive boyfriend in his quest for musical greatness. Yet she is not depicted as some perfect girlfriend, or as the devil incarnate. She is as flawed and just as capable of jealousy or anger as anyone in real life, but also is good and understanding. This comic has situations form actual life that is rare in western comics. The composition in this comic is as good as you will ever see. The art is cartoonish but I feel this gives it a charm that would be lacking if done in a realistic way. He uses very strait forward and easy to follow panel layouts. Nothing tricky, block to bock. Sometimes using a two stack block now and then. This is his representation of real life. The inevitable progression forward. Cold and hard like reality. Then when the music plays he lets it all go. A cacophony of images curved and busting though the panel leaving a broken scaffold on the page witch the dancing notes have busted though into a curved, intertwining mess. This is one of those comics you realise you have been looking at the page for a few minuets and not even bothered to read a words yet. On top of the ultra-awesome relationship stuff between the characters are in this fantasy backdrop. The lead guitarist is in tune with the music of the earth, the Bass Player is an immortal(?) who as mastered and forgotten magic, their drummer is a bear, there are monsters stalking the town at night... and so on. The magical aspects appeal to me as there is an attempt to explain them using existing scientific theory. The idea of music vibrating and all matter vibrating and things like that. Yet I feel that the supernatural aspects really detract from the core of this book. It simply didn't need it to be good and I'm not a fan of "random character is something crazy" type thing with the drummer. That being said it didn't annoy me much either as the rest of the comic is so good. It reminded me a little bit of iZombie. Where what drew me to Sing no Evil was the characters and the story of their lives, even the magic I really loved. Yet the supernatural elements become strong and stronger towards the end of the comic. I fear that as new volumes come out the core of what makes this comic great could be lost amongst fighting monsters and casting spells. Yet the supernatural aspects are what elevate this story into something not only consumable by the average comic reader but also give the writer a angle to explore some interesting things. It allows the writer to discuss the mystical power of music on the soul in a "real" way. The characters can experience it and with them the reader and draw philosophical inferences about art, and obsession as well as a host of other themes that are never directly spoken of in the comic. 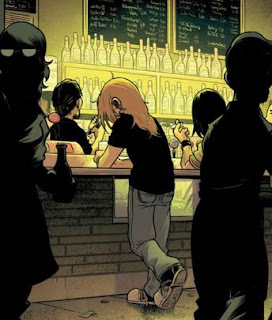 So there is no preaching making you want to throw your book across the room here, but at the same time larger issues can be personified in the comic for the characters to interact with. It is probably becoming clear I only write a review if I really like the comic, and this is no exception. I think it is firing on all cylinders and is a must read for anyone interested in non-super hero comics. The characters are likable, well written and the art is engaging, though I did have some difficulties determining the female characters apart and while at its core it is a relationship comic the supernatural aspects really give it a neat gimmick that totally works. The only real detractor is that it ends so abruptly and yeah it is nearly 200 pages. Trust me it ends to soon. I hope that there is more coming.